After decades of crafting squash-blossom necklaces, pendants and bracelets, Jerry Domingo knew he would have to quit making jewelry because he couldn’t see very well anymore. A sturdy Navajo grandfather, silversmith and revivalist preacher, Domingo lives in a one-room house smaller than a single-car garage in the windswept sagebrush desert near Nageezi, New Mexico. His home is mere miles from the picturesque badlands Georgia O’Keeffe painted and Dzilth Na-o Dithle, the sacred portal where the Navajo believe the first people came out of the earth. But it’s a long distance from all that the modern world seems to promise – grocery stores, jobs, medical care. Domingo’s home is new. It has unpainted walls, plywood floors and a woodstove but no insulation or electricity. Now, he sells his wares when he travels to preach all over the reservation. But with his failing eyesight, it has been getting harder to do the detailed work. After all, it takes a good four days to make a full squash-blossom necklace. At night, the glow of kerosene lamps is too dim. Even during the day, the home’s interior is full of shadows, making it difficult to hammer and solder metal into art. Before members of the Durango Daybreak Rotary Club installed a solar light, Jerry Domingo relied on light from his window. Through a pastor at a local church, Domingo found out about a program through a Rotary club in Durango that brings solar-powered lighting to remote homes on the Navajo Reservation. A solar light is a simple thing: A small panel the size of a baking sheet mounts onto a roof with a pole, and a wire runs from the panel into the house, where up to three rechargeable lights hang from hooks on the ceiling. To turn on the lights, Domingo simply has to touch a button. 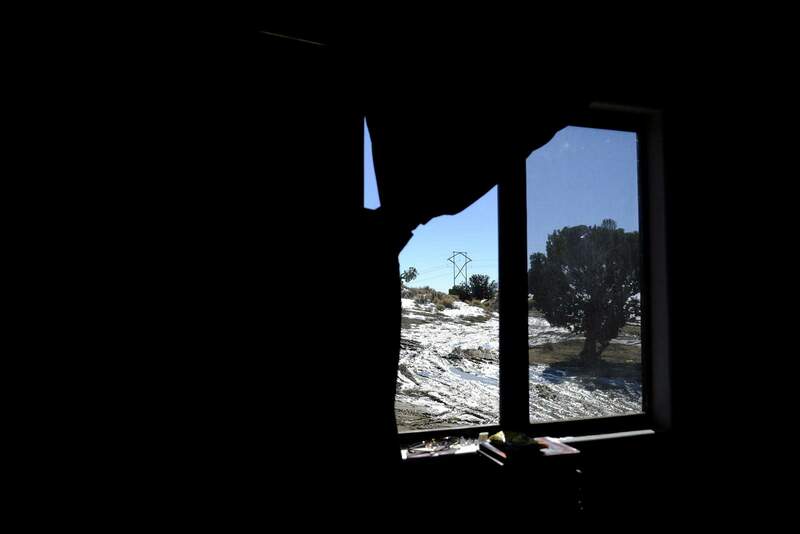 In the dark of The Checkerboard It’s not unusual for Navajo homes to lack electricity. The reservation, bigger than the state of West Virginia, sprawls across Arizona, Utah and New Mexico. It’s a harsh, beautiful land marked by extremes of temperature, sun, wind and dryness. Many Navajo – Diné in their own language – have lived in these rural areas for generations, as the land is passed from grandmother to granddaughter. The remaining chunks became a patchwork of lands administered by federal, state and other entities. Now, when a house is separated from utilities by these checkerboard-like lands, it can be difficult and expensive to secure the rights-of-way. Rotarian Joe Williams grew up in The Checkerboard in the 1960s, not far from where Jerry Domingo’s house now stands. The son of a natural gas worker, he went to work in the oil and gas fields at age 14. But he still remembers riding the bus 48 miles to school and 48 miles back, one of the only white kids in a crowd of Navajo children. Williams now owns an industrial water-purification company in Aztec and employs many Navajo people. He has been a member of the Durango Daybreak Rotary Club since 1996. He always loved international service projects. In 2013, he traveled with a group to Nepal to trek along the Great Himalaya Trail and install solar lights in teahouses, which offer food, lodging and other services to hikers. The group planned a project that would bring solar lights to at-risk populations on the reservation, including elders older than 70 and disabled tribal members. Soon after launching, the group asked Williams to become the project leader. Williams has an air of gentleness about him and an indomitable wellspring of energy. He walks with the slight stoop and occasional uncertainty of Parkinson’s, which he staves off with determination. In one year alone, Williams coordinated 90 service trips to the reservation at his own expense. Transformative power of lightOne weekend last November, a group of Rotarians and international exchange students, part of the Mountains & Plains Rotary Youth Exchange, drove from their homes in southern Colorado across the state line and into northwest New Mexico. The wind was howling, kicking up sheets of dust, making the town of Shiprock look like a scene from an apocalyptic movie. But overhead, long spine-like clouds lay across a desert sky, turning pink and purple with sunset. 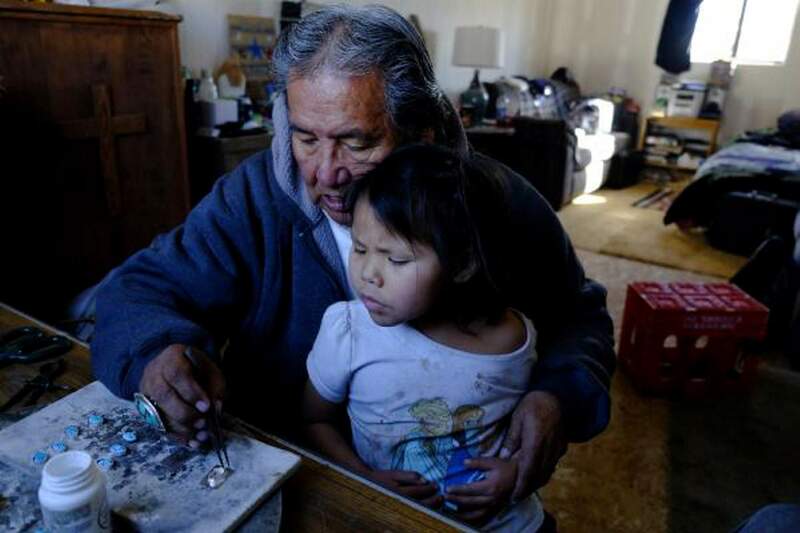 Jerry Domingo shows his granddaughter how he makes jewelry. Domingo can now make jewelry under solar-powered lights. Danny Simpson, the Nageezi delegate to the Navajo Nation, says Williams’ respect for the Navajo helped build trust. The beneficiaries are largely elders, the disabled and other at-risk individuals and families. 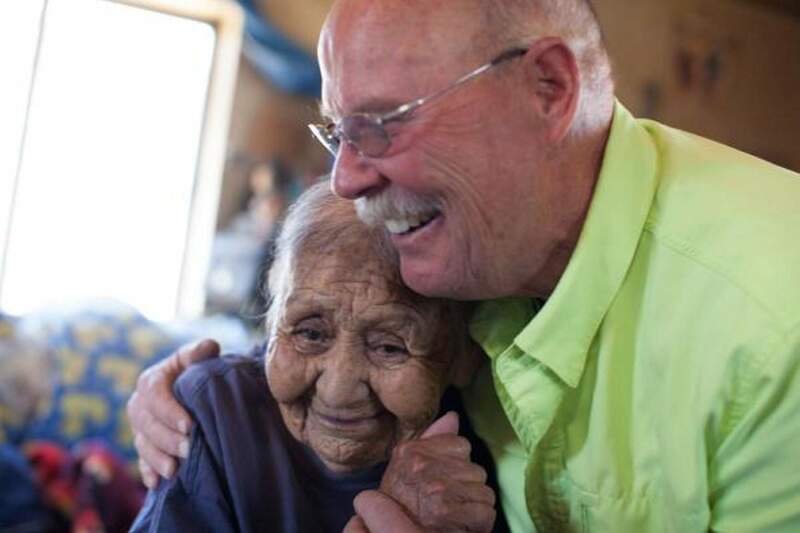 That day, the recipients included Albert and Joe James, brothers in their 80s who live in a one-room house with two twin beds and a woodstove way out at the end of a rugged dirt road in a solitary canyon. They’ve spent their entire lives in this spectacular enclave of rusty sandstone cliffs and big skies, herding their sheep. They speak to Smith in Navajo, telling him that they’ll be able to play cards, work on artwork and do puzzles with the new lights, passing the long, dark hours of winter. They’ll also be able to use the flashlights to go to the outhouse at night, a comforting prospect considering they’ve struggled with both a bear and a mountain lion that have started visiting regularly. “The lights are a real plus for them,” Smith says. “They use them for basic necessities. They can stay up longer, play cards, read books. Their grandkids can do their homework.” Williams also says that the lights provide more time in the evenings for elders to practice and pass on long-held traditions, such as weaving, to their families. Over the past few years, volunteers from all over the country have enjoyed opportunities to sample regional cuisine at the chapter house, participate in a sweat lodge with a local medicine man and learn about a vastly different culture. Tangible changeWilliams and the Durango Daybreak Rotary Club hope the project continues to change lives on the reservation. They are working with the Navajo Nation to pursue grant funding for further solar units and to train crews of young Navajo tribal members as installation and repair technicians. So far, progress is slow, but the group is persistent. “That’s what the Navajo say: ‘We have time. If we don’t get to it today, we’ll get to it tomorrow,’” Williams says. “We continue to make our installations every year, and we have great support because people see the results. Already, we’re getting requests to buy lights” from people who don’t have electricity but can potentially afford to buy the solar lights, which cost about $300 each. Jerry Domingo, the silversmith and preacher in Nageezi, has now enjoyed his lights for more than a year. Life out here is secluded and beautiful but can be punishing. In summer, temperatures top 100 degrees, and in winter, they plummet below zero. With rain or snow, the roads become muddy and rutted. Even though Domingo now lives by himself, he is usually not alone. His remaining children and grandchildren, friends and neighbors cycle in and out of his home. This story was also produced by Stuart Cleland. It was first published on www.rotary.org. 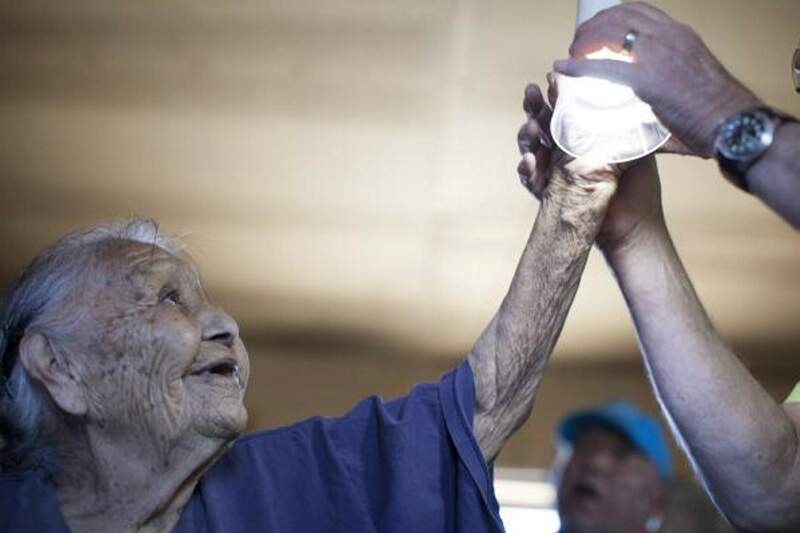 Irene Guerito, a resident on the Navajo Nation, receives a solar light from the Durango Daybreak Rotary Club.